Last February, from the 11th to the 18th we had Michele Dobner at BELE, teaching at the workshop entitled “Mineral Ground for contemporary makers”. 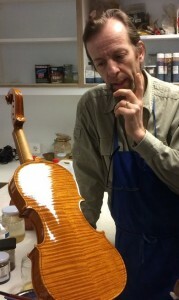 This italian violin maker told us how to prepare the wood prior to varnishing and the use of minerals and pigments. After this we varnished with OldWood products. To end up the workshop, and following some precise steps, we learned how to polish the varnish to get a nice and organic finish. We also had the very instructive visit from Mª Carmen from this varnish making firm who told us about the properties and qualities of their products.